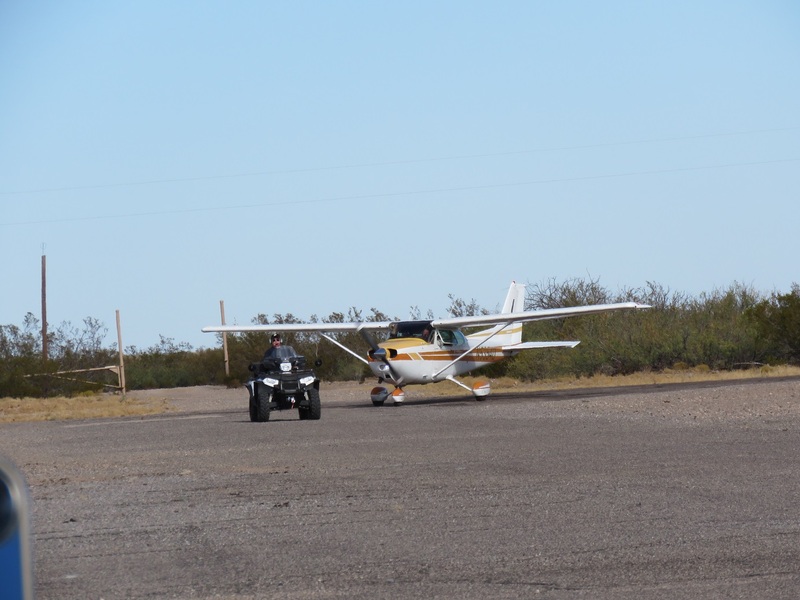 Just over twenty EAA Chapter 1570 members, many of whom are also active FASF members, Flew and drove over to Columbus from the El Paso, TX area to take part in their Chapter’s first ever group Fly-Out. Those who drove to Columbus served as shuttle drivers for those who flew over and their passengers. FASF Members, Mike Florey and John Keithly, who is the 1570 Chapter’s President, supplied mobile radio gear so that air and ground traffic could be easily coordinated. 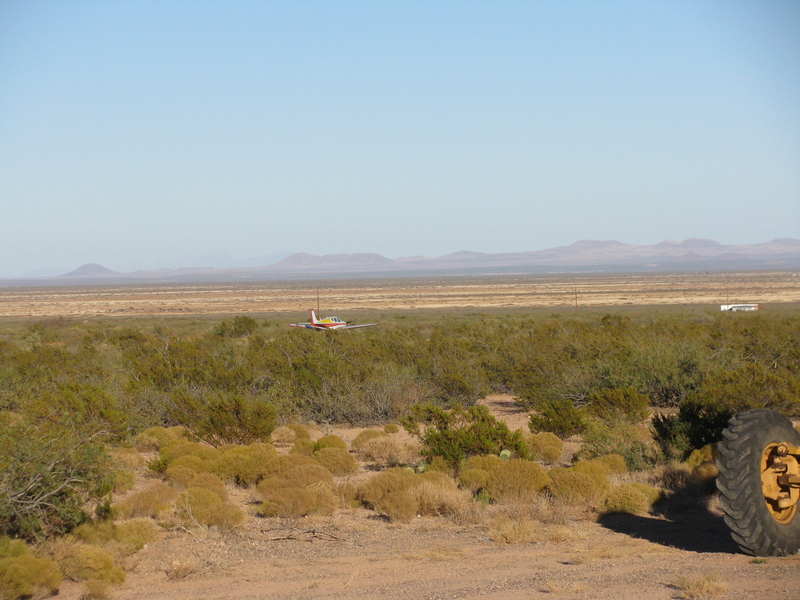 Mike even converted his ATV into a “Follow-Me” cart, and proceeded to guide each incoming plane to its parking space. 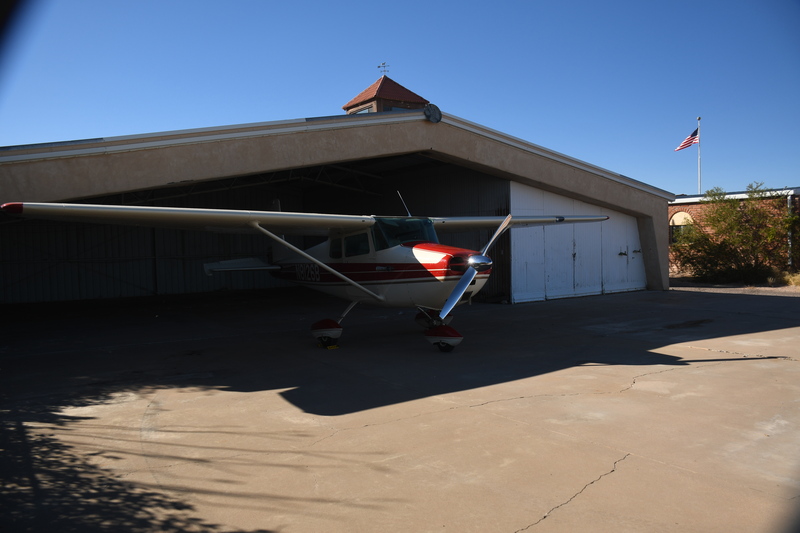 Several FASF members, who are also homeowners at the Airpark, graciously offered their extra hangar space to those who arrived first. Some of the below are photographs taken by Mike Florey and Bob Wright. Bob also even shot some novel airborne video footage of the group’s activities using his special camera equipped Drone. This was stitched together with some ground video footage to make the below 5:50 long video, which shows some of the tour’s highlights. The actual footage in the above video is only about 5:50 in length, while the remainder is devoted to the film’s credits. The weather cooperated for this first Fly-Out adventure for the Chapter aviators. While they all encountered a cross-wind, it was not serious enough to create any problems. 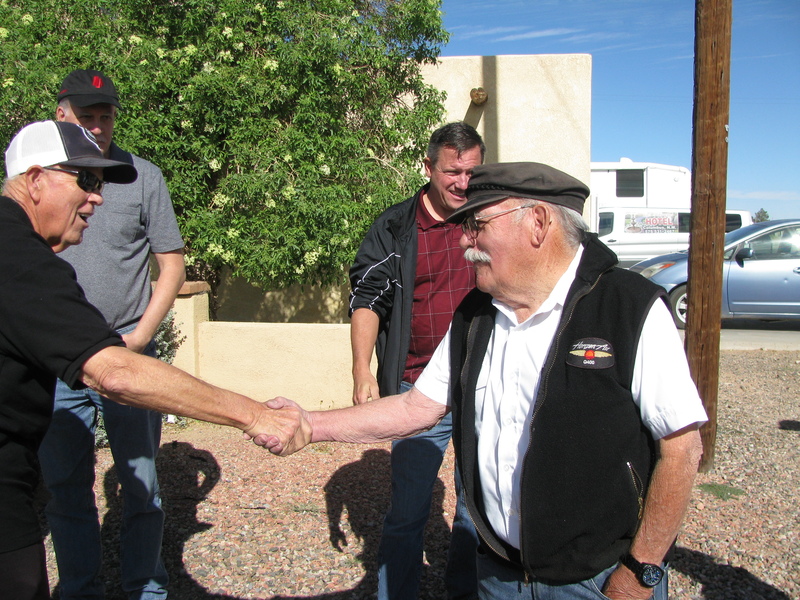 The Fly-In visitors enjoyed meeting the Mayor of Columbus, Philip Skinner, who gave them a warm welcome, and informed everyone about what is happening in the small border town and the Village’s plans for the future. 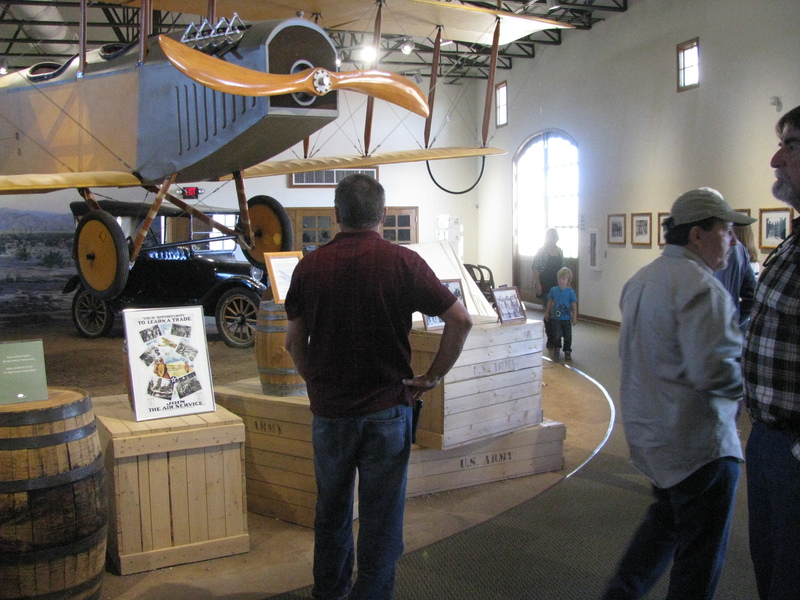 Then the group drove to the historic 1st Aero Squadron’s famous 1916 Airfield, to witness first-hand where American Airpower was launched and where the American Civil Aviation Industry was re-born. 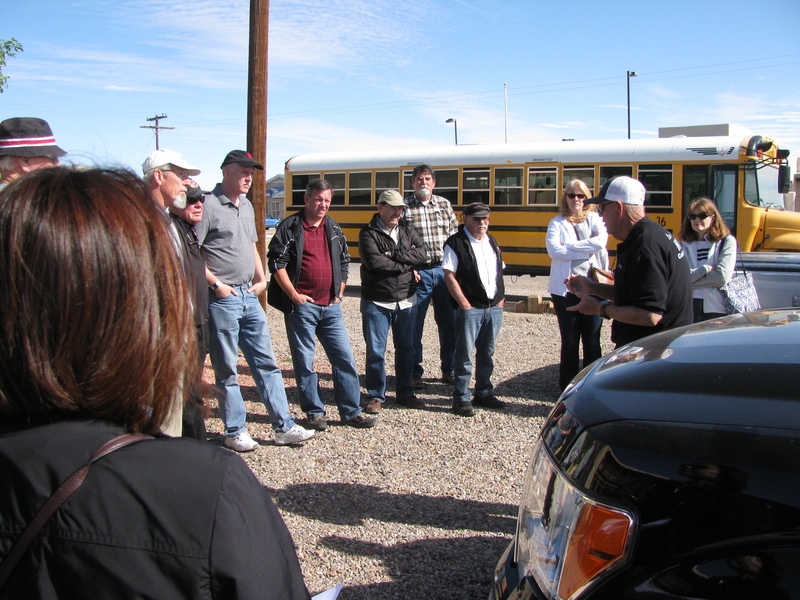 The group also visited the Columbus Historical Society’s popular “Depot Museum” and then the also famous Pancho Villa State Park. 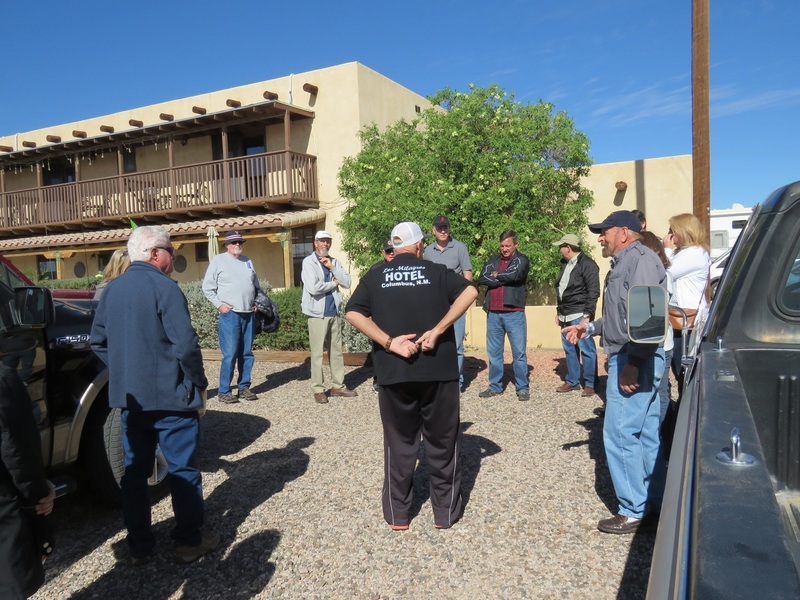 Both these sites are dedicated the the historic events surrounding the infamous raid on the sleeping town back in March 9, 1916, in which Pancho Villa’s revolutionaries killed 19 Americans and set the town ablaze. Cessna 172 parked in hangar. Photo by Mike Florey. 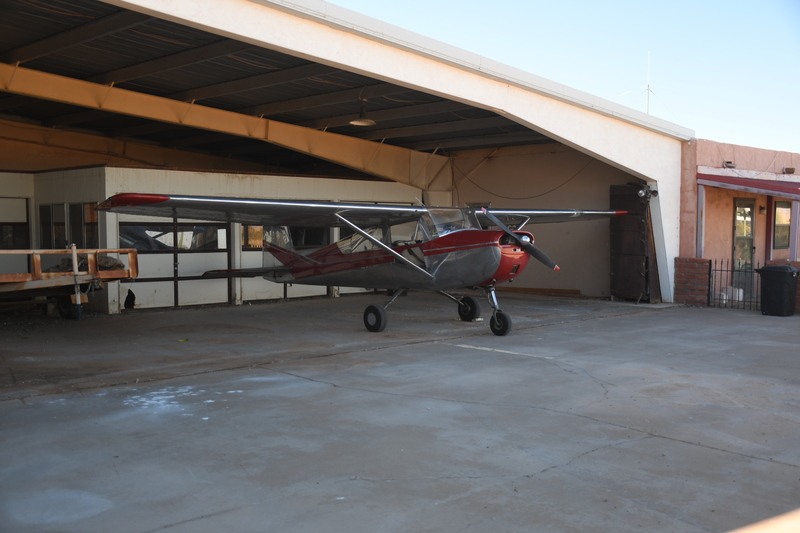 Juan Brito’s Cessna parked in another hangar. Photo by Mike Florey. 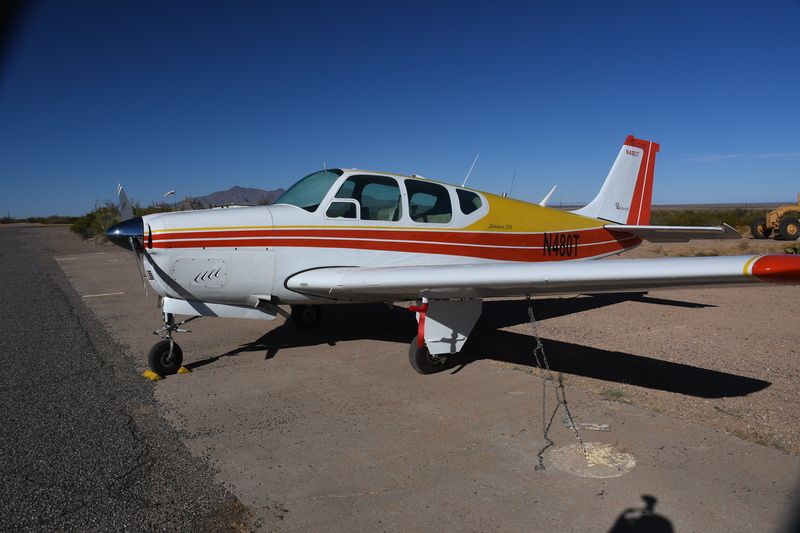 Dr. Pedro Blandon’s Beechcraft Debonair at tie down. Photo by Mike Florey. Columbus Mayor Philip Skinner (center in black) welcomes visitors to Columbus. Photo by Bob Wright. 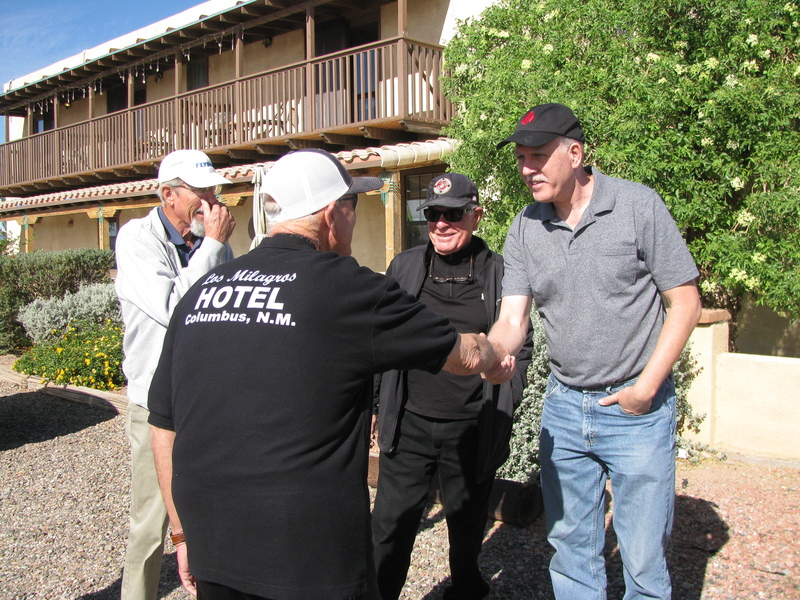 Mayor Skinner greets Jim Foster at right, and (L ro R) John Keithly and Jerry Dixon. 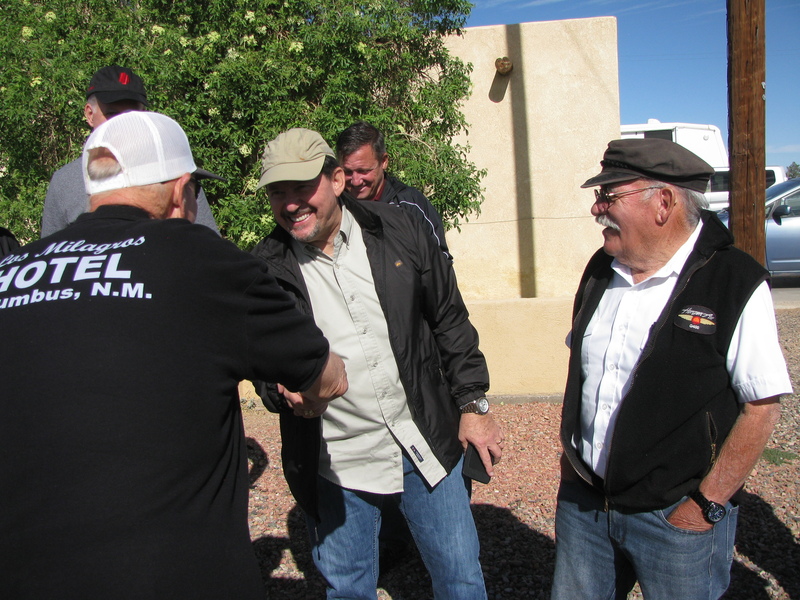 Mayor Skinner welcomes Juan Brito while (L to R) at rear are Jim Foster and John Signorino. Mayor Skinner welcomes Judge Alex Gonzalez as John Signorino and Juan Brito look on. 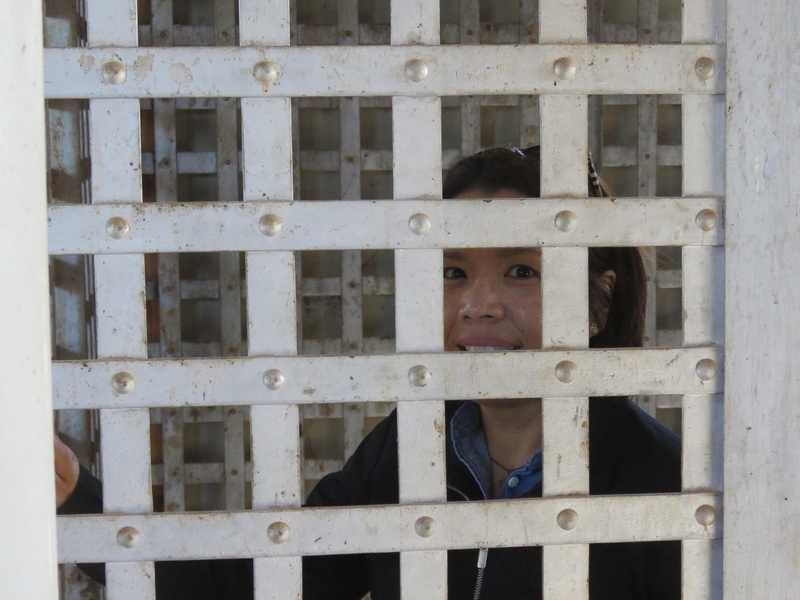 Akemi Robinson looks out from behind barrier inside the historic old 1916 Columbus Jailhouse, across the street from the Mayor’s Los Milagros Hotel. Photo by Bob Wright. 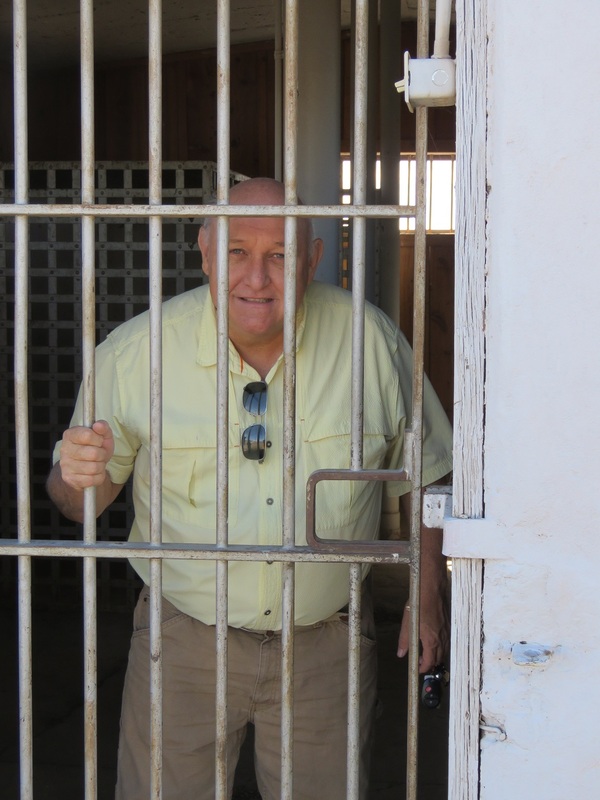 Akemi’s husband, Mike Robinson also poses inside the historic 1916 Columbus Jail. Photo by Bob Wright. Mayor Skinner, at right in black with white cap, wishes the group an enjoyable tour of Columbus. 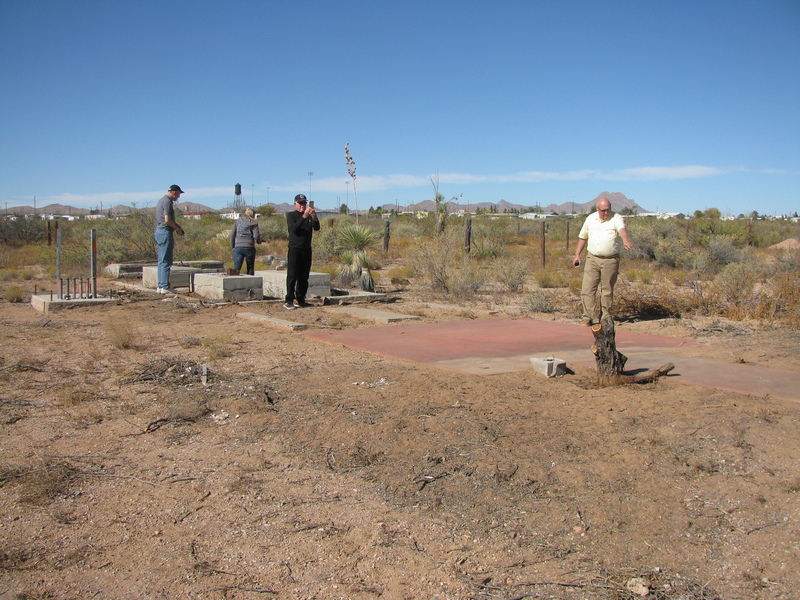 L to R: Jim Foster, Kathy Whelen, Jerry Dixon and Mike Robinson exploring the old US Airways Marker Arrow and the numerous foundation blocks remaining from the old Columbus Municipal Airport’s CAA Buildings . . .
L to R: Above. at the old 1920’s Airway Arrow are Judge Gonzalez, Jack Roulet, John Keithly and John Signorino. 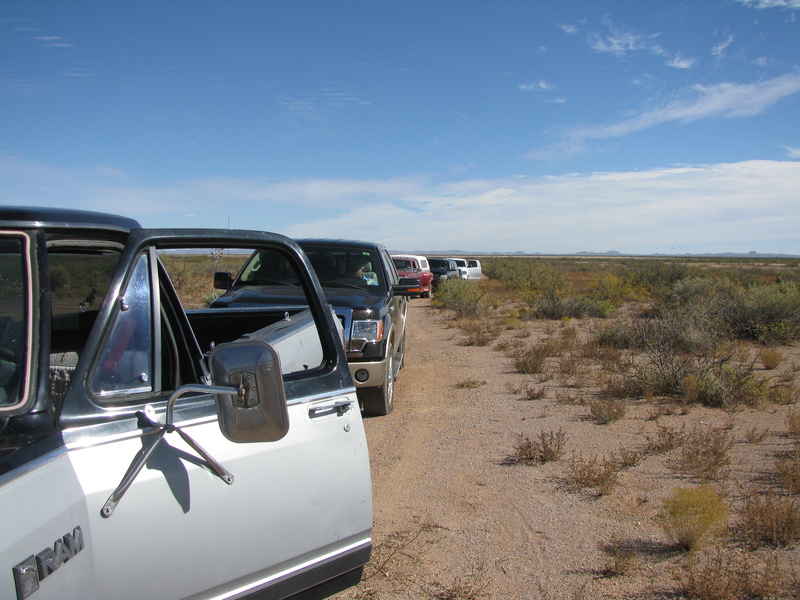 Cavalcade of vehicles readies to leave for the Depot Museum and the famous Palomas, Mexico, Pink Store, a proud business supporter of the First Aero Squadron Foundation. 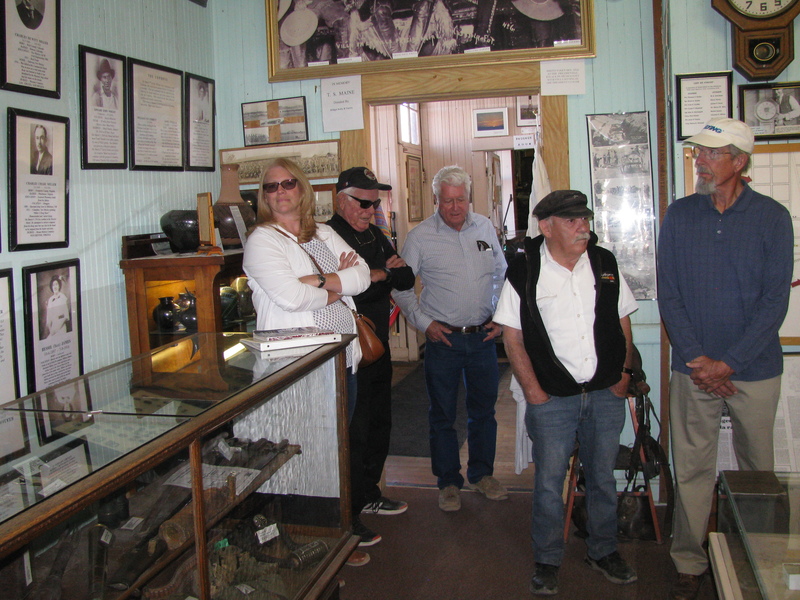 Inside Depot Museum with (L to R): Melinda Signorino, Jerry Dixon, Lewis Lawrence, Juan Brito and John Keithly. 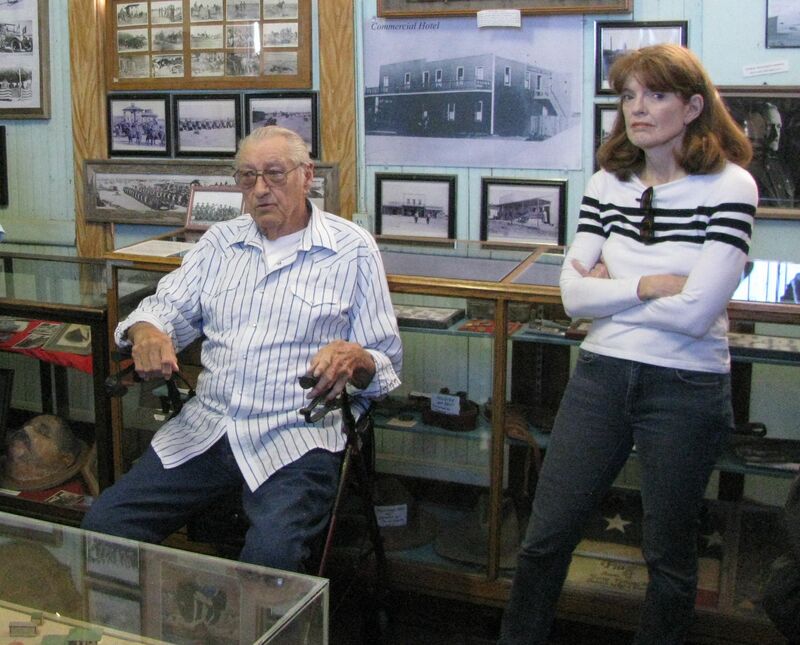 Columbus’ official historian and President of the Columbus Historical Society (which operates both the Depot Museum and the surrounding properties), Richard Dean (L) presented a brief history of the infamous raid and its consequences to the EAA/FASF visitors. At right is Melissa Keithly. Mr. Dean’s great-grandfather was one of those civilians murdered by the Villista raiders during the infamous raid in 1916. He had owned a local mercantile company. 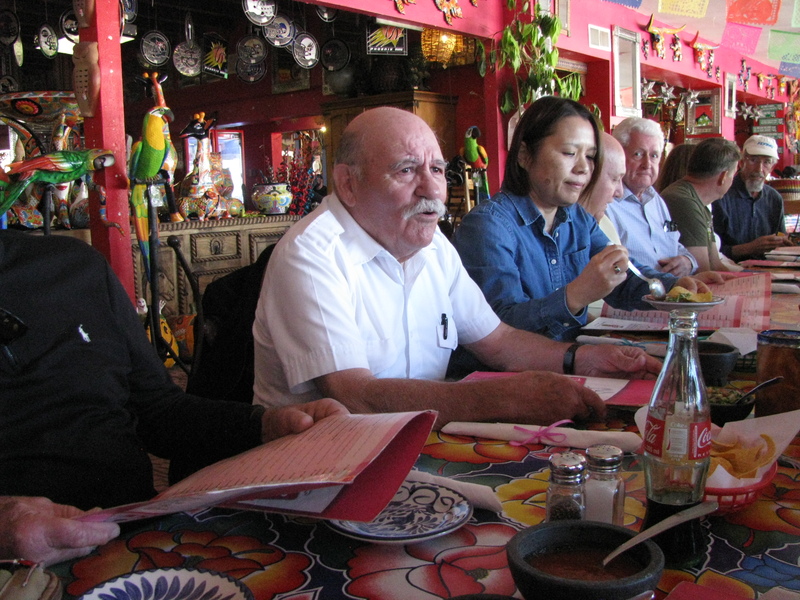 After their visit to the Depot Museum, the group crossed the border to have lunch at Palomas, Mexico’s Pink Store where they were entertained by a talented local Mariachi band and had the pleasure of personally meeting the store’s creators and owners, Sergio and Ivonne Romero (see photo of Ivonne below), who also have a home in El Paso, Texas. 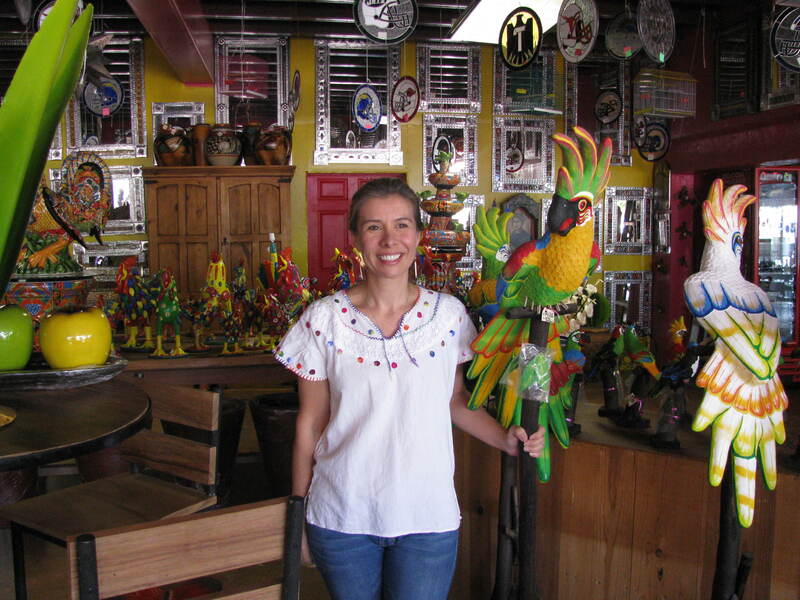 Ivonne Romero posing among a few of the thousands of unique works of art she keeps on hand for sale to her International clientele. Ms. Romero regularly travels throughout her homeland to find gifted artisans in order to keep her Pink Store inventory like that of no other similar outlet. The Romeros also own a store in Silver City, New Mexico. 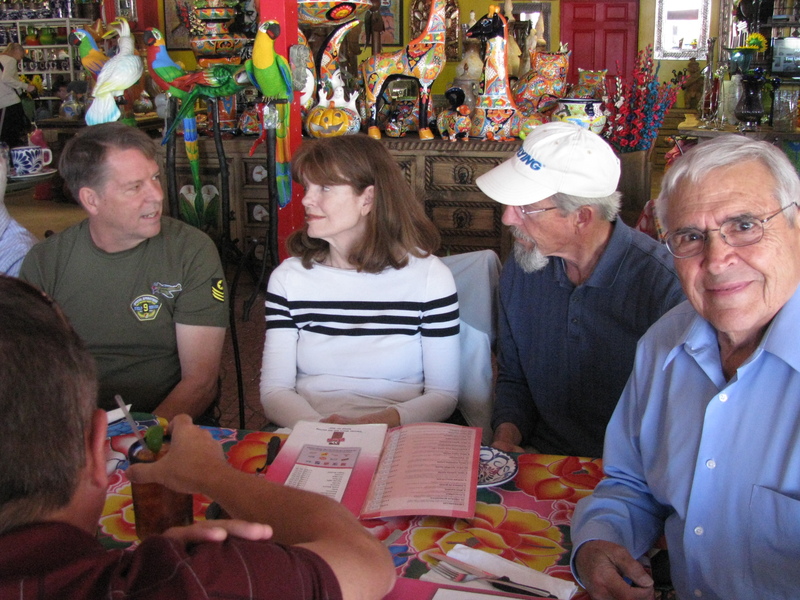 Above are (L to R): Mike Robinson, Melissa and John Keithly,and Ralph Navar. 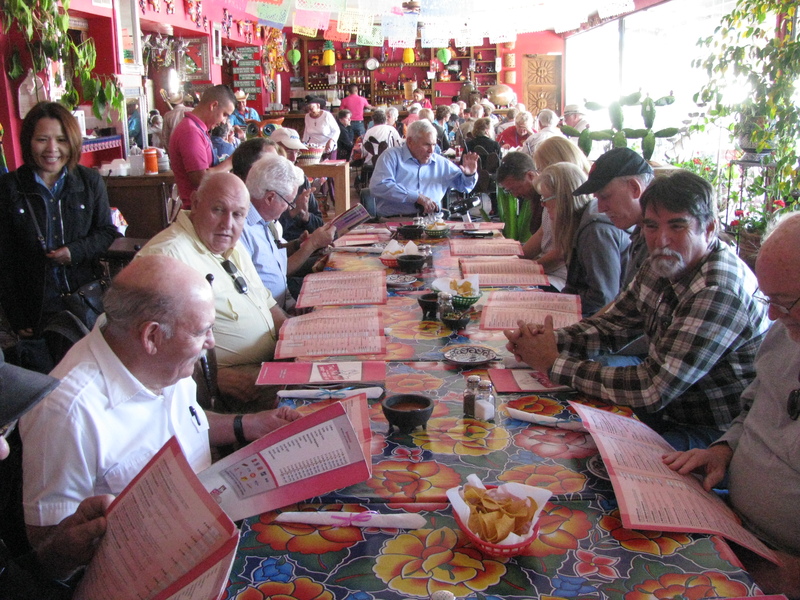 A special table was arranged by the Romeros for the group of aviators – and here they are contemplating their menus. 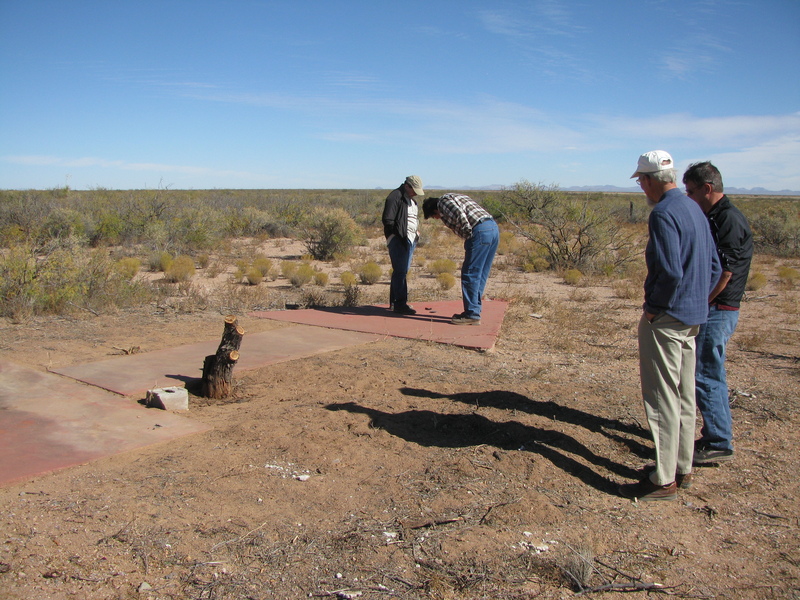 Pancho Villa State Park – FAS Jenny to upper left is studied by John Signorino. Judge Gonzalez and Jack Roulet to the right. 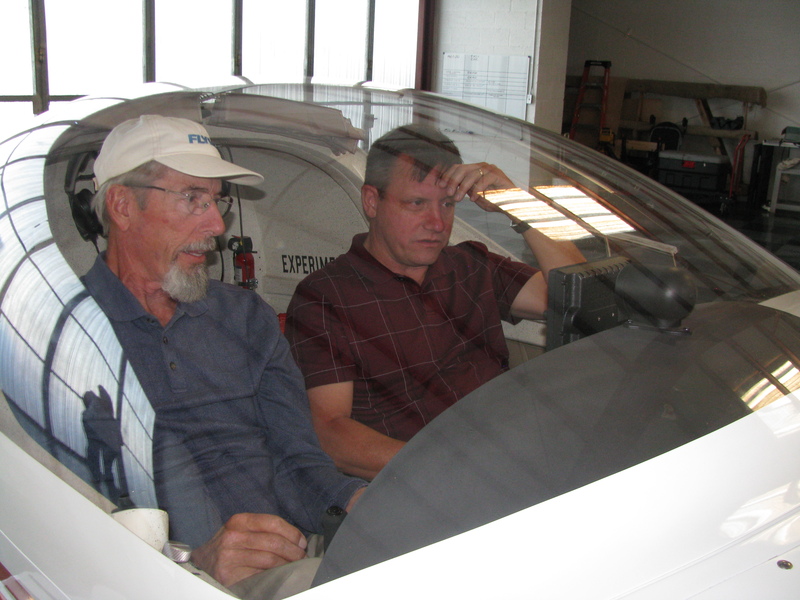 Inside Mike Florey’s Airpark hangar, before departing, (L to R) John Keithly explains to John Signorino the features of his airplane . . . The end of a festive day in Columbus and Puerto Palomas, Mexico, sees the last plane, Dr. Blandon’s Debonair, take off for home. This entry was posted in AVIATION NEWS, HOT NEWS!, NEW VIDEOS on December 31, 2017 by FASFRIC. With the discovery of the Airmail Arrow, the purchase of the historical Airfield, etc., things are really moving out there in Columbus….congratulations on a great year of accomplishments!